The 100% non stick grilling solution! No more wire brushing the grill. Just throw the mat in the sink with a little soap and water and rinse...done! Keeps the cooking even and flare ups eliminated. Love them! My other half loves it. He says its so much easier and keeps the grease from sometimes going through the grill and getting on the pavement or I mean the concrete. Its ease enough to clean, just put in sink put dawn on it with a pot scraper. Works as advertised and that surprises me . we use it every time we cook on the grill. Enjoy it , You will not regret. Worked great. Grilled mushroom and zucchini vegetables and coho salmon. Had a nice smoky flavor and easy to clean. So AWESOME , I purchased more for friends and family ! Needs to have a larger size for big grill tops. Anyway I purched two. Now I won&apos;t drop food between the grates. Great product. These really do work . I love mine .Every time I use them my Nephew tries to talk me into giving them to him which I won&apos;t . So I told him where to get his own . im still scared to use it :) but it works . they are a great item! Great product.No more scraping my grill tecleanup.Highly recommended it. works great.cleanup is a breeze. Cooks very well and thoroughly while keeping the grill clean. Great product. Havn&apos;t used it yet, but good. It really works. Love it and use all the time. 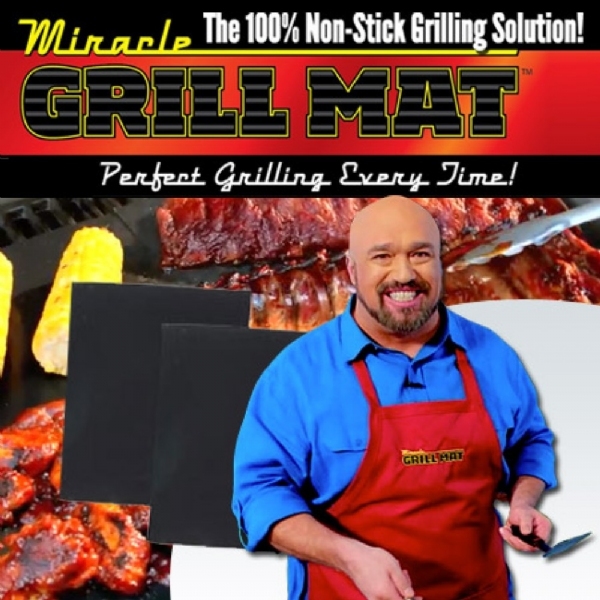 The Miracle Grill Mat works great! I even bought a second one to give to my son. He likes it too. These are birthday gifts for my daughter. Best thing to happen to grilling! My dad loves Miracle Grill May! It really works!! Burgers cook without the mess. Works very good for groove marks and preventing food from falling onto grill heat. This item is great! I love cooking everything on the grill during the summer months and the Miracle Grill Mat allows me to do that now, so much easier! I bought 2 grill matts. I made the mistake of placing them on the grill when the fire was to hot and not ready to grill on. My wife cleaned them up and just in time for the meat to throw on the grill. The grill mats worked much better. Ribs, links and corn on the cob. Easy clean this time.